Barbecued pork spareribs make an ideal summer dinner entree. Cook spareribs in the oven or slow cooker to serve ribs to your family any time of the year. 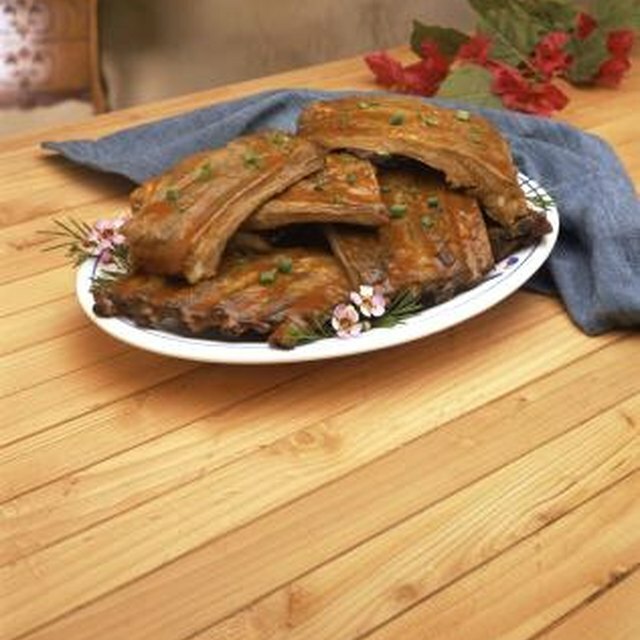 Regardless of the method, cook spareribs over low heat to preserve moistness. Use store-bought, mixed spice blends and sauces to make cooking spareribs even easier. Pork spareribs generally cost less than baby-back ribs, but you may need to buy more of them to create a satisfying meal. Spareribs come from the breastbone or bottom section of a pig's ribs, as opposed to baby back ribs, which come from the top section along the back. Spareribs cost less and come in larger portions, but also tend to have less meat per bone when compared with baby back ribs. Grilling ribs is a great way to impart extra flavor into this cookout favorite. If using a liquid marinade, marinate the spareribs and place them in the refrigerator 24 hours or longer prior to grilling. If using a dry rub, apply the rub to the meat two hours or less before cooking. Apply a light coat of mustard before applying the rub for additional complexity in the flavor. Spray the grill rack with cooking spray or cover the grill with nonstick aluminum foil before transferring the ribs onto the grill. Cook the spareribs over indirect heat for 1-1/2 to 2 hours. Apply a barbecue sauce, teriyaki glaze or other favorite sauce to the ribs during the final 15 to 30 minutes of cooking. The ribs must cook until tender and reach 160 F.
Slow-cooking offers a great way to whip up a mouth-watering main course as you do other things during the day. Prepare ribs for the slow-cooker by cutting them into two-rib or three-rib portions. Two-rib portions work well for most older children, but very young children may need one-rib portions. Add a dry rub or seasoning mixture of your choice to each rib portion. Brown the ribs in the oven by broiling for approximately 10 minutes before transferring them to the slow-cooker. Add a thorough coat of a homemade or prepared sauce, roughly 1 to 1-1/2 cups for every 2 pounds of rib meat. Cover and cook on low for six to seven hours. Or cook the spareribs on high for 3 to 3-1/2 hours. When you pull them out, the rib meat should practically fall off the bone. Even baked ribs can be completely scrumptious. Apply a dry rub to the ribs, thoroughly rubbing the spices over the entire surface of the meat. Add a dry ranch dressing seasoning mix to your spices for a flavor twist. Set the ribs in a refrigerator for two to four hours. Just before you pull the ribs out of the refrigerator, heat your oven to 300 F. Line a baking pan with foil and place the ribs on top. Or place a broiling rack inside a baking dish and place the ribs inside the rack, allowing the fat to drain off during cooking. Cover the ribs with foil and cook them for two to four hours. Turn the ribs over halfway through cooking and occasionally baste the ribs with their juices. Remove the foil during the last 30 minutes, baste with your favorite sauce, and finish cooking. Safe, medium-done ribs reach an internal temperature of 160 degrees, while well-done ribs reach 190 degrees.